We are always ready to learn more about nutritional supplements, superfoods, and ways to improve our health via nutrition. 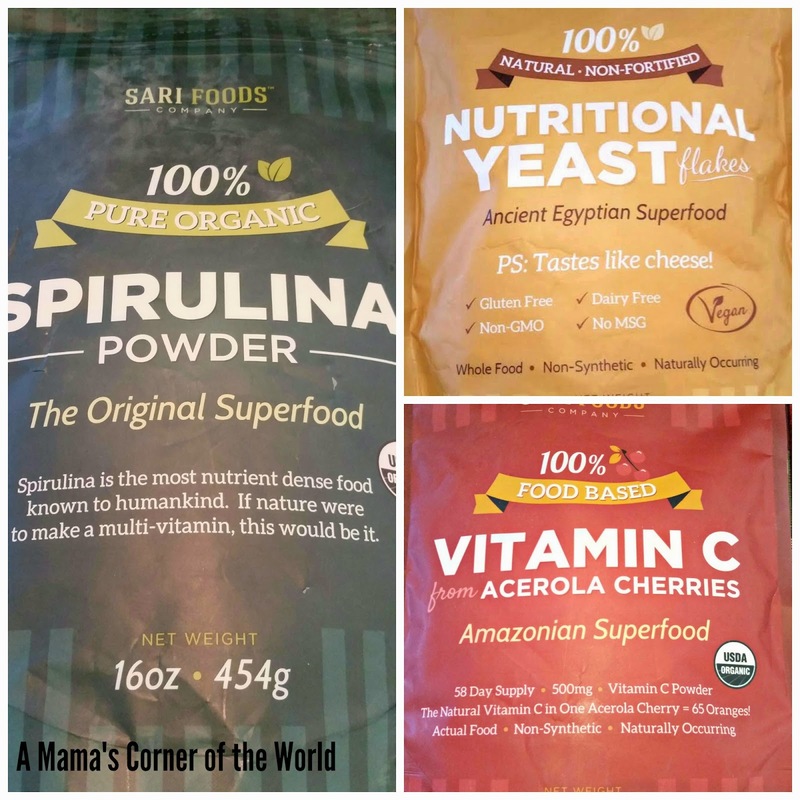 We recently had the opportunity to sample and review three products from Sari Foods company: Nutritional Yeast Flakes, Vitamin C from Acerola Cherries, and Spirulina Powder. All three powders offer superfood characteristics in convenient, easy to use, supplement powder form. What did we think of the Sari Foods products? We received complimentary samples of each of the products for use in our reviews. All opinions and experiences are our own. A little about Sari Foods Nutritional Yeast Flakes. 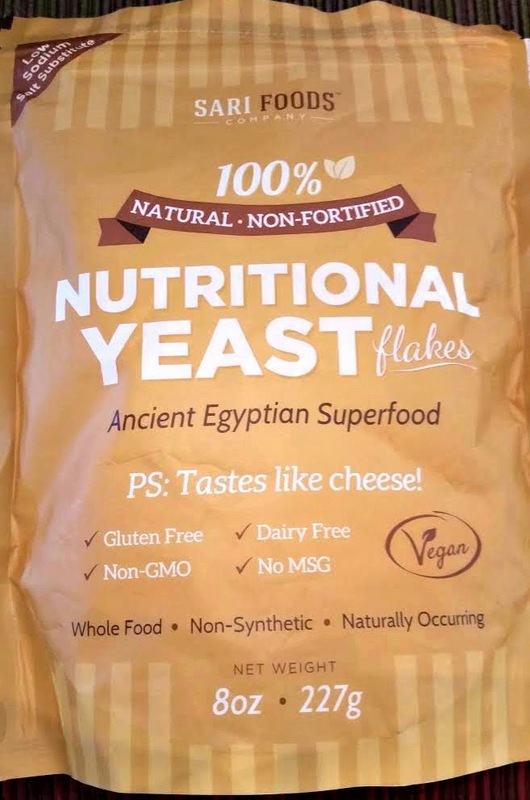 These nutritional yeast flakes are gluten free, non-GMO, dairy free, MSG free, vegan, non-synthetic and naturally occuring. With a slightly salty, nutty, cheese-like taste--nutritional yeast makes a wonderful low sodium, low fat substitute for salt or cheese in dishes. Lose Weight Naturally. Enjoy guilt-free deliciousness with this salty, creamy, nutty, cheese-tasting superfood that can be sprinkled on just about everything and is bound to become your secret weapon in weight loss! Fight Aging and Free Radicals. Sari Foods Nutritional Yeast promotes cellular repair and regeneration. Then, by combining the two antioxidants glutathione and selenium, our Nutritional Yeast Flakes create a special enzyme called glutathione peroxidase that is known to neutralize free radicals and protect us from their damage. End Your Energy Crisis. 15-40% of Americans are deficient in B vitamins which can lead to deep and ongoing fatigue, brain fog, irritability, depression, and even insomnia (as they play a crucial role in melatonin production). The body depends on B6 to make the hormones serotonin and norepinephrine, which affect both mood and feelings of happiness. With improved Vitamin B intake, we can sleep well, balance our hormones. increase our energy levels, clarity & overall mental function. The packaging is simply loaded with information. Presented in an easy to understand form, the package offers a readily available source of product details for those of us a little less in the know about nutritional yeast flakes. I was initially a little concerned the the texture would be grainy--and the flavor too much like traditional bread-making yeast as that was my only prior experience with yeast. I was very surprised by this product. It has a slight scent--sort of nut-like...sort of cheese-like. The scent is not at all unpleasant and is hardly noticeable on food. 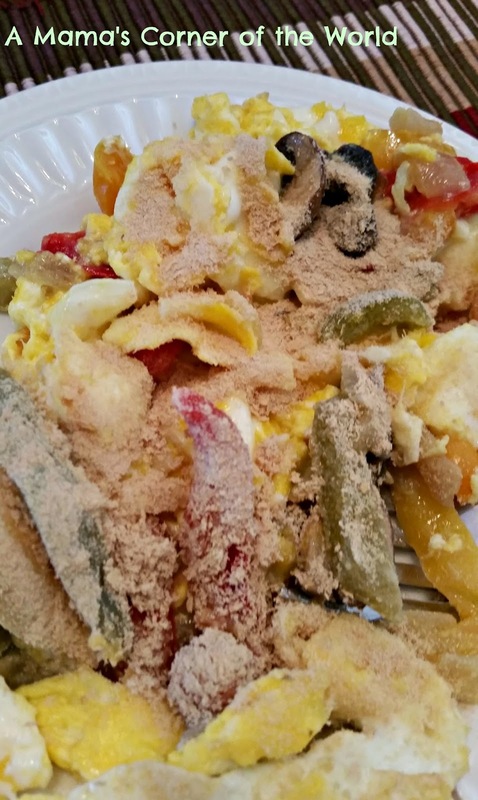 I did not taste the nutritional yeast plain--I first used it on my usual breakfast egg and vegetable scramble instead of salt and cheese. I did not pile on 2 heaping tablespoons as the serving size on the package notes. I was worried about the texture--so I sprinkled on about half that amount! The flavor worked very well with the egg and vegetable mixture. I didn't miss the salt and cheese at all. The texture was not at all as I expected. It was was not grainy and seemed to dissolve a bit into the warm food. After that first trial--I heaped on the full serving with breakfast! Would I recommend Sari Foods Nutritional Yeast Flakes? Do not let the name and appearance discourage you from trying this product. It actually does taste good--and serves as a very suitable salt or cheese substitute. These nutritional yeast flakes offer a powerhouse of B vitamins and important minerals in an easy to use, easy to store, powder, supplement form. Remember that this is a nutritional supplement--so be sure to manage the vitamin and mineral levels appropriately into your regular diet. A little about Sari Foods Vitamin C from Acerola Cherries. The Vitamin C from Acerola Cherries powder is 100% food based. 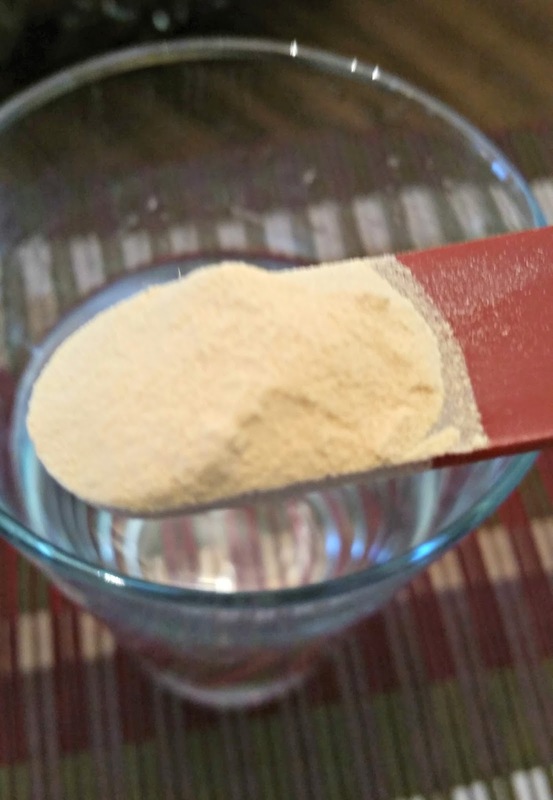 Offering 500mg of Vitamin C per 1 teaspoon serving, this natural vitamin C powder lasts up to 24 times longer than synthetic vitamin C supplements. Promote cell recovery and regeneration. Protect against diseases such as cancer, heart disease and Alzheimer's. Reduce the symptoms of allergies, asthma, and arthritis. Again, this product's packaging is simply loaded with information. Presented in an easy to understand form, the package offers a readily available source of product details. This product has a light scent--and it isn't fruit like. If you have every tried powdered fruits--they seem to carry an earthy scent with little hint of the fruit they once were. I first tried the powder in water. That was certainly not pleasing to me. The packaging suggest adding coconut palm sugar--and that may help. The flavor is a little like overly ripe, bitter fruit. I have used it in smoothies since that first sip and the flavor hides well with other sweeter fruits and flavors. 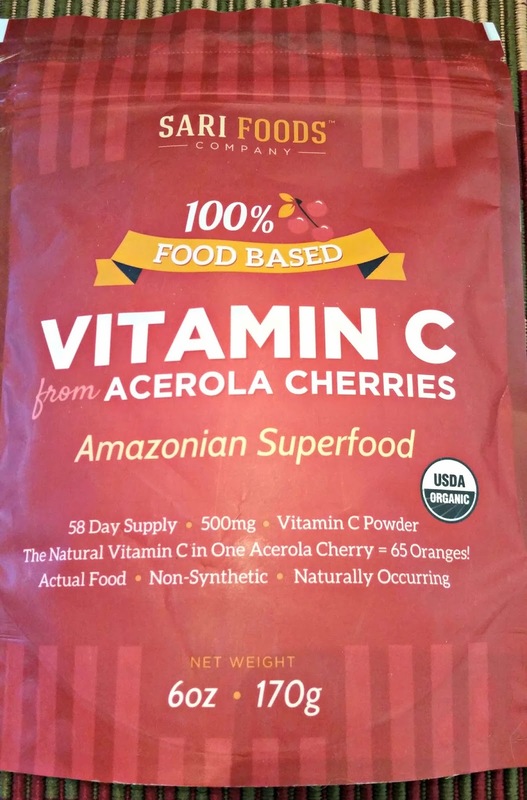 Would I recommend Sari Foods Vitamin C from Acerola Cherries? I did not like the taste of the product alone in water--but, it blended well into my afternoon smoothies. Again--it is important to remember that this is a nutritional supplement--so be sure to pay attention to the serving sizes and adjust accordingly to your dietary needs. A little about Sari Foods Spirulina Powder. 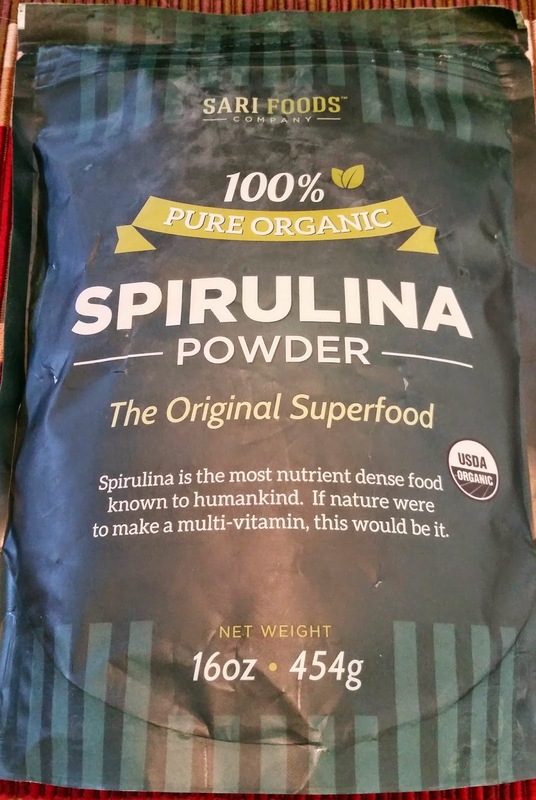 The Spirulina powder is 100% organic. Spirulina offers over 100 types of vitamins and nutrients. Nature's multi-vitamina, of sorts. Fight aging. Promote cell recovery and regeneration. Protect against colds, flus, viruses and diseases such as cancer. Boost energy, stamina and metabolism. Our personal experience with Sari Foods Organic Spirulina Powder. Again, this product's packaging is loaded with valuable product information. 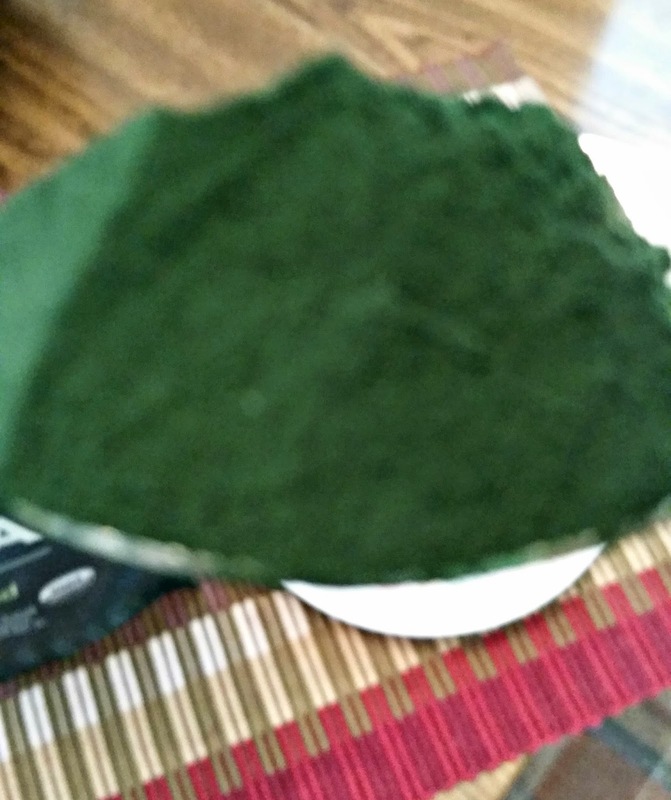 The Spirulina Powder looks very plant like with its deep green color. This product has a "product of the sea" scent. It isn't an extremely strong scent--but, it was enough of a fishy/oceanlife smell that it's noticeable. I blended the product into green smoothies and added it sauteed greens as those seem to blend well with the powder's slight taste and scent. Would I recommend Sari Foods Spirulina Powders? I did not like the taste of the product--but, it blended well into my afternoon smoothies. Again--it is important to remember that this is a nutritional supplement--so be sure to pay attention to the serving sizes and adjust accordingly to your dietary needs. Our overall thoughts on these Sari Foods products. If you are seeking a nutritional supplement that is easy to use and easy to incorporate into your diet--this brand offers whole food based products that are easier for your body to use than synthetic supplements. I would recommend blending them into foods or smoothies. I did not care for the taste of any of them in water, juice or alone. The prices of these products are quite comparable to similar quality products--and they are available on Amazon with easy shipping (currently free to Prime members). At Sari Foods, we believe that the foods we eat have the ability to nourish us fully and completely. And, that natural nutrition - as opposed to synthetic, laboratory-made vitamins - provides us with the fuel for life without any of the drawbacks. We created Sari Foods with the hope of delivering ancient foods to modern life. In Indonesian, the word "sari" means essence. At Sari Foods Company, our mission to bring you the "Essence of Food”, empowering conscious consumers to return to nutrient dense, single ingredient, pure foods as our source of life and sustenance - just as nature intended. This post is brought to you by Brandbacker.